There doesn't seem to be any alternative to the southern sun and the Black Sea for someone who wants to have rest and recreation and to improve his or her health? We say there is: odorous pine forests and bowery oak-woods, hay harvest fields abounding with flowers, picturesque riverbanks and snug sunny bathing places near slow rivers and crystal clear forest lakes of the Karkiv region. Not without reason some landscapes yet in the last century were titled as "Kharkiv Switzerland". Numerous tourist centres and rest homes, children's campuses, sanatoriums, and just Kharkovites' favourite resting spots are situated across the green zone of Kharkiv, Bogodukhov, Krasnokutsk, Gotwald, Volchansk, Izyum. Most beautiful places in Kharkiv region are the banks of the Pechenezhskoye and the Krasnooskolskoye reservoirs. Whole camps appear in these places in summer. There are a lot of yacht clubs along the banks of the reservoirs. The scenes where the forests come close to the edge of the water near the lakes in Kharkiv, Chuguyev, Gotwald and other districts are amazingly beautiful. Korobovy Khutora village which is situated in Korobovskoye forestry in Gotwald district is from of old famed for its beauty. In the vicinity of the village, along the banks of the Seversky Donents, there are summer houses, sport facilities, and tourist centres. Surrounded by orchards and dense forests, the buildings of the "Korobov Khutor" rest home rise high above the banks of the Donets river. People from various towns and villages of Ukraine go to rest to the "Severny Donets" rest home which stands on the high banks above the Donets, in the dense forest near Eskhar village in the district of Chuguyev. In the pine forests of Volchansky district there is a beautiful rest home called "Verkhne Pisarevsky". There are plenty of sanatoria in the vicinity of the city, "Kharkov" rest home, for example, or "Yuzhny" on the banks of a large lake in the middle of a pine forest. The area traditionally reserved for summer houses is the town of Pesochin. 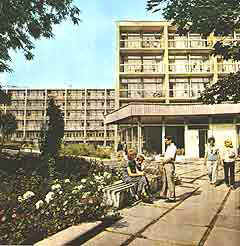 People from different parts of the Soviet Union used to come to the "Roshcha" rest home and "Rai-Yelenovka" sanatorium. In the outskirts of Lubotin on the bank of a forest lake there is a rest home called "Medic", occupying the estate that used to be owned by noblemen. Near Vysoky village there is a rest home of the same name. The buildings of the tourist centre near Vasishchevo are smothered in greenery and flowers. A number of preventative care sanatoria attached to plants or factories are situated in Pyatikhatky. Curative mineral spring water, clean forest-steppe air, superb natural conditions, kind and considerate attitude of the staff are at the disposal of those who come to the "Berezovsiye Mineralniye Vody" sanatorium near Peresechnoye village in the district of Dergachy. There are sanatoria in the districts of Bogodukhov and Krasnokutsk, too. The name Gaidary suggests a nice summer rest. In the north-west part of the region, twelve miles away from the town of Bogodukhov there is situated the Sharovsky park, a landscape-gardening monument of the XIX century. The park sprawls across the slopes of a wash adjoining the Merchick watercourse and covers the area of about 100 acres. A castle-palace, situated on a high hill, is the centre of the park. The adjoining part of the park is laid out in a regular style - plain alleys, geometrically shaped flowerbeds, esplanades, straight paths. Further on begin landscape designs shading off into natural forest. A huge wash divides this part of the park into south and north slopes. The south slope is dominated by the coniferous species, and on the north slope there are fragments of the remaining virginal oak-wood. The powerful gigantic oaks are from 150 to 300 years old. Side by side with the aboriginal trees in the park, there settled exotic plants: Virginia juniper, mahonia, Amur corc. The Sharovsky sanatorium operating since 1925 in a former squire estate is one of the best sanatoria in Ukraine. Many people were fascinated by the picturesque nature of Kharkiv region, and many were inspired. The forests near Babai were the favourite place for meditation of G. S. Skovoroda a famous educationalist, philosopher, and poet. With a fine touch of lyricism are painted the native landscapes by the well-known artist, Izyum-born S. I. Vasilkovsky in his works "Korobov Hamlet", "Stone Wash", "On The Donets". The beautiful nature of Kharkiv region is also presented in the works of the well-known Russian artist I. I. Sokolov who was T. G. Shevchenko's contemporary, his friend and follower. The paintings of P. A. Levchenko ("In Kharkiv Region"), M. A. Berkos ("Poppies", "Apple Tree In Blossom") are full of poetical feelings. Century old oaks of the forest near Kochetok for evermore won the young I. E. Repin's heart. You may share his admiration if you decide to spend your summer holiday in Kharkiv region.